No trip to Las Vegas is complete without a look inside and out at Steve Wynn's fabulous Wynn Hotel, one of the key landmarks along the central part of the Las Vegas Strip - the hotspot of Las Vegas Boulevard and home to many of the world's largest and most beautiful hotels. Steve Wynn's Las Vegas success story is more interesting than that of any big time gambler. His amazing properties have set new standards worldwide. Wynn parlayed his stake one of Las Vegas early casino hotels, the "Golden Nugget", investing in larger projects including his groundbreaking luxury masterpiece the Bellagio which was later sold to MGM Grand. 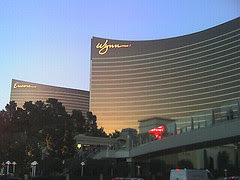 Wynn built his current masterpiece the Wynn with those profits and followed up with the Encore several years later, one of the more recent additions to the Las Vegas Strip Scape.